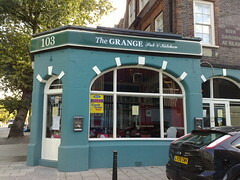 Pub on Grange Road in Bermondsey. Note: It came under new management in 2014 and we haven't visited since. The comments below may be out of date. It has a sign saying it is over 30s unless you are eating or with a family group. secretlondon went here one lunchtime in October 2008. I had the steak sizzler (£6.90) and a coffee (£1). They have three hand pumps, which had Old Rosie, Spitfire and Abbot Ale. There is a beer garden and I saw signs referring to accommodation. Last visited by secretlondon, October 2008. Last edited 2014-09-22 10:24:29 (version 9; diff). List all versions. Page last edited 2014-09-22 10:24:29 (version 9).